On January 1 this year, China enacted the revised Population and Family Planning Law, allowing a second child for every couple nationwide. As for the birth issue for couples in step families, the central authorities allow regional governments to carry out their own regulations. Take Beijing for example, couples in remarriages (excluding those who remarry the same spouse) are eligible to give birth to two children, if the two parties in total only had one child in their previous marriage. However, if they already have more than one child before entering the current marriage, they are only allowed to give birth to one. Other provincial governments largely allow remarried couples to give birth to at least one child. From a family perspective, a stepfamily should also be treated as a new family, in which a child plays an important role in maintaining the family bond; hence, the child's birth right should be respected. Families with only one child, no matter out of choice or restriction, are fundamentally fragile and prone to risk. Amid a low birth rate, China should underscore the safety of demographic structure more as a means of bypassing these risks starting with policymaking. This is because the country needs a "reserve of young people" and the family needs "a reserve child" to fend off risks. A more liberal and autonomous birth policy means more happiness and better protection. A sample survey conducted on Nov. 1, 2015 showed that China's population stood at 1,373.49 million, up by 33.73 million, or 2.52 percent, from 1,339.72 million during the sixth national population census in 2010. In appearance, China's population is still on the increase, but it has already started digesting the huge negative momentum amassed during the 1990s. China's population has long witnessed a low-growth period, and will start to diminish in 2028, or even earlier, according to a U.N. prediction. In other words, the good days for China's population will soon be over, followed by a period of continuous low birth rate and demographic debt. Hence, China should not worry about having too many people, but about an unwillingness to give birth. The population issue in China today is far different from that of 35 years ago. The change is one from the pressure of sheer size to the problem of an imbalanced demographic structure, from a high birth rate to a super-low birth rate, and from a simple issue to a complicated issue. The new demographic policies should at least respond to two appeals, promoting the total development of mankind, and preserving the balanced demographic development. But the key is whether China can restore the correct value of the population, along with its development, management and solution making. The value of the population should comply with the universal value, while the management of the population should be based on a nation's basic conditions. Population is more than a number, but social groups, people's minds and human rights. Since population is the driving force of social development, China should seek to return the birth right completely to its people as early as possible, apart from creating the condition to encourage the willingness to give birth. In that way, China can escape the "endogenous low-fertility trap" to raise its demographic development as the rejuvenation of population is already part of the nation's rejuvenation. But nationwide, at least regionally, China has been stuck in the endogenous low-fertility trap, meaning that a total relaxation of birth control would not lead to a baby boom, or a remarkable rebound of the birth rate. 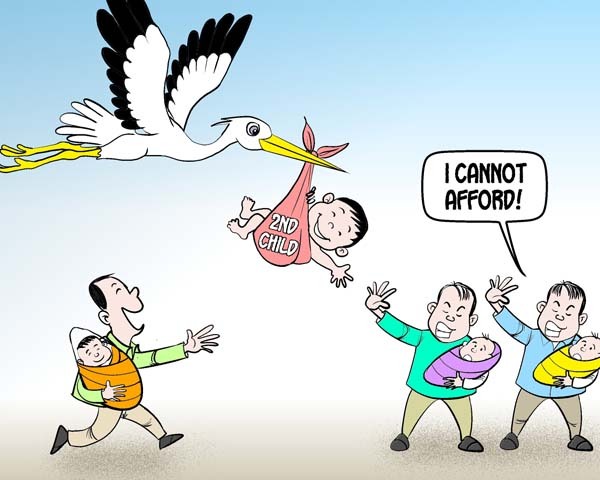 China is currently characterized by high cost and a low willingness to give birth. Therefore, the government has to vigorously encourage birth in order to moderately improve the situation. Population represents the cluster of people and it is a community of shared future. Population is not only the condition and method of development, it is also the purpose of development. Even a population rise will lead to a shortage of medical and educational resources; its natural growth should not be limited. Instead, the government should seek to create an ideal environment for such growth. Mu Guangzong is a professor at the Institute of Population Research, Peking University.